When diplomacy fails and only the clash of steel can prevail, our country looks to the rarified ranks of the best and most capable — its generals. Called upon in the direst of circumstances, these honorable warriors lead the charge of our armed forces against our enemies. In these ranks are esteemed names such as Washington, Jackson, Grant, Eisenhower, MacArthur, Schwarzkopf and Petraeus, to name just a few. The pages of this magazine will consider not only their accomplishments but the people behind the names. We will relive their most famous accomplishments on the battlefield, as well as consider the impact they had upon the greater world. 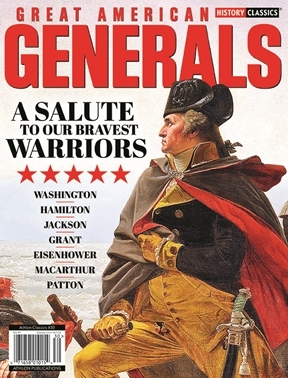 So, join us within the pages of this magazine for a trip through history, ranging from the Revolutionary War to the War on Terror that rages still today — and better understand those who stand fast against the dangers of the world.